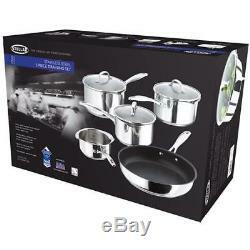 Stellar 7000 Induction Stainless Steel Draining 5 Piece Saucepan Pan Set- Silver. Small Appliances > Cookware & bakeware > Cookware. 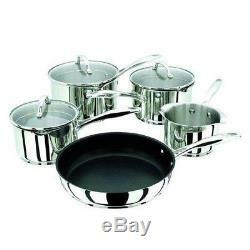 This five piece draining saucepan set includes 16cm/18cm/20cm saucepans together with a 14cm milk pan and 26cm frying pan. Thick hot forged bases ensure even heat distribution on all hob types including induction. Premium stainless steel with cast handles and useful internal measuring guide. All Currys/PC World Outlet guarantees are non-transferable. Hob Suitability: All hobs including induction. 16cm (1.6litre capacity) saucepan - 16cm diameter, base diameter 14. Cm, overall size 34cm, 16cm high with LID and measuring guide. 18cm (2.3litre capacity) saucepan - 18cm diameter, base diameter 16.5cm, overall size 36cm, 18cm high with LID and measuring guide. 20cm (3.2litre capacity) 20cm diameter, base diameter 18cm, overall size 40.5cm, 19cm high with LID and measuring guide. 26cm NON STICK frying pan, base diameter 22cm, overall size 46cm, 10cm high. 14cm milk pan (1litre capacity) - 14cm diameter, base diameter 12cm, overall size 31cm, 12cm high. This product has no reviews yet, however see what our buyers say about our other products.. Small box electricals like computers, tablets, camera's, small kitchen appliances. We deliver within the UK only. We don't post to Channel Islands or Internationally. Warehouse/store pick-ups are not available. For more information, read on.. Courier selection is standard and will depend upon value and/or weight/dimensions of the product. Express: DPD - for safe, secure, signed-for deliveries to your door. This includes Northern Ireland and the Isle of Man. We do not accept orders to PO Box addresses and International orders, including those from the Republic of Ireland, the Scottish Highlands and the Channel Islands. Orders for large domestic appliances are accepted to all mainland UK addresses (including Northern Ireland) and the following islands: Isle of Skye, Isle of Sheppey, Anglesey, the Isle of Wight, and the Isle of Man. This excludes the Channel Islands and BFPO. To create your return label. Unopened - in an as new condition - unused, without installation or data input - in the same condition as supplied to you - complete with any accessories and free gifts offered with it - with the original box and unopened packaging. Unwanted products cannot be accepted after 30 days if any of the above criteria are not met. The right of cancellation does not apply in the following circumstances. When the product seal has been broken on any DVDs, CDs, memory cards or software, including games - On any personal hygiene products such as shavers, hair care products - On headphones, where the seal on the packaging is broken - If you want to return a Software Product Activation Key card which is not faulty, the silver strip on the back of the card must be fully intact as new. Complete the Reason for Return note that came with your parcel & include it in the parcel with your return. Take your parcel into any Post Office. To find your nearest Post Office. You received an incorrect item - you received a damaged item - you received a faulty item. Can a Currys or PC World retail store help? Reassuring 12 month guarantee on all products. The item "Stellar 7000 Induction Stainless Steel Draining 5 Piece Saucepan Pan Set- Silver" is in sale since Wednesday, March 28, 2018. This item is in the category "Home, Furniture & DIY\Cookware, Dining & Bar\Pots & Pans\Pan Sets".